Metro station: Malostranska (line A). Then tram 22 to Pohorelec. The stunning church, Loreta, is set in a delightful courtyard surrounded by chapel-lined arcades, near to Prague Castle. 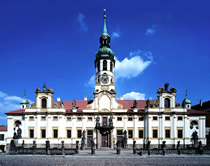 Loreta is an important pilgrimage site, commissioned by Baroness Beligna Katherina von Lobkowicz in 1626. It was conceived to promote the legend of Santa Casa, a copy of the house believed to be the Virgin Mary's. After completion, Loreta was maintained by the Capuchins, an order connected with the Brotherhood of St. Francis of Assisi. Loreta has original fresco pieces, and not to be missed is 'Prague Sun' and its 6000 plus diamonds located in the Treasury. A 27-bell carillon plays on the hour every hour, a beautiful sound ringing around the courtyard outside. Pause and listen, and admire the serenity of the situation.